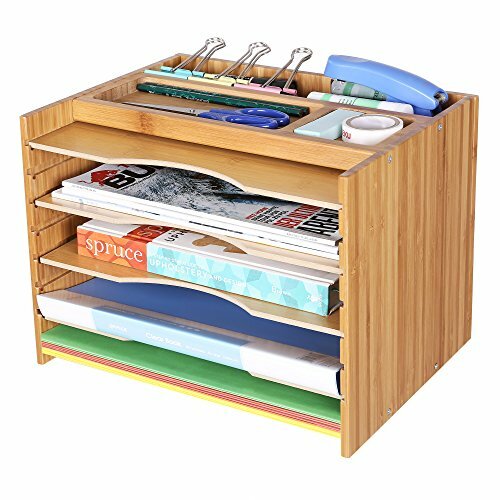 This Songmics bamboo file organizer is a wonderful solution to keep your desk and all of your papers neat and organized! It features natural sustainable bamboo that is sturdy and waterproof, meaning you can wipe it with a damp cloth if it gets dirty. Even more, the file organizer comes with 5 individually adjustable shelves to fit various amounts of paper stock on hand. It also combines the characteristics of a file cabinet, brochure holder and magazine rack in one single storage system, which offers you endless storage possibility. Round corners and counterbores are made to protect you and your important papers. Get this practical and durable file organizer and give your office supplies a neat and tidy home! INNOVATIVE DESIGN: Specially engineered slots to prevent the shelf from sliding off while removing files; top mini compartments provides multiple options for calculators, staplers, sticky notes etc.